You move into the most boring street in the most boring town in Australia. Tarrawagga is a hole. Its only ambition is to be a crater, and it has every chance of getting there. The last thing you expect is to have action all around you, dangerous strangers in the backyard and bullets flying past your ears. At your new school, everyone thinks you’re the biggest loser in Grade 6. Little do they know. When they realise the truth, teachers and students alike are in for the shock of their lives. 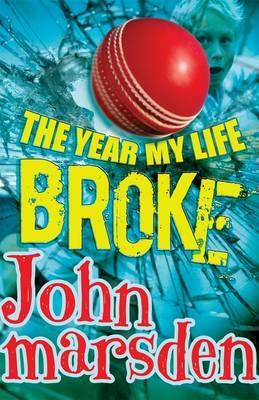 Funny, gripping and full of surprises, The Year My Life Broke could be the most real book you read this year. Warning: This book is not a fantasy. It contains no superheroes, wizards, dragons, time travel, aliens or magic. Lately I’ve read some excellent real-life Australian novels for 9–12 year olds that I’ve little doubt had a female-only readership. So I was excited to see a book about ordinary events and relationships that no boy would feel ashamed to be seen with but which also has a healthy respect for girls. The stakes in this book are low compared to current popular fantasy and dystopia, but when you’re 11 like Josh – a likeable, self-aware character – and your life is shattered by a sudden move to a dowdy country town, the stakes may seem refreshingly close to home. Josh surprises himself by avoiding the one thing that would help him fit in at school: his cricketing prowess. But he can’t hide his talents for long. Soon everyone is relying on him to drag them out of inter-school humiliation and into glory. The story is light on family relationships but Josh is no meathead, just a bit caught up in himself. A secondary plotline involving a boy next door is a subtle message about remembering that no matter how rough your life feels, that other kid is having an even harder time. Don’t let the great big cricket ball on the front fool you – this is a story to be enjoyed by cricket fans, for sure, but it’s also a tight and easy read about identity, security and second chances.